AUSTIN, TX -- Greens, without question, make a golf course. They are the personality, the heart and soul of any layout. If the greens are in poor condition, it's likely the golfer will remember that as opposed to the nice clubhouse or even a good score. In Austin and Central Texas, with more than 50 golf courses to choose from, the greens are as varied in style as they are in overall conditions. So who has the best, and why? "Bluebonnet Hill has greens that are true, smooth and roll at a pretty good pace," said Beth Cleckler. Cleckler knows a little something about greens. She is not only the head pro at Morris Williams Municipal Golf Course; she is also a 14-time winner of the Austin Women's City Championship. 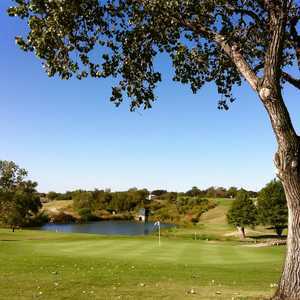 "The Golf Club at Star Ranch also has excellent greens. They are more undulating and tougher than Bluebonnet." Lindsay Bowman, general manager of Star Ranch, said his course features the popular Tiff Eagle greens that are kept at around 10.5 on the Stimpmeter. "They like our greens because they're faster than normal. We roll them and verti-cut them so it takes out the grain. The best thing is they also hold on the approach." Roy Bechtol agrees. Bechtol has some familiarity with greens, particularly those at Star Ranch. He designed the course, which just opened more than a year ago. "Tiff Eagle is a lusher grass and is easier to maintain. Bermuda Champions was the new panacea grass from above three years ago," Bechtol said. "Now, the older it gets, the more thatchy it gets. Tiff Eagle has taken its place in popularity." While the jury is still out on both Champions and Tiff Eagle because of their relative newness on the scene, there is no question they are popular and can result in a quality surface. 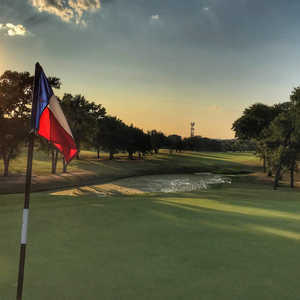 At Barton Creek and its four golf courses, which are known for everything including superb putting surfaces, there is a mix of Champions, Tiff Eagle and Tifdwarf. 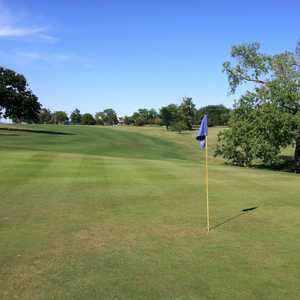 Interestingly, bent grass, which is considered by many to be the best of all the putting surfaces because of its lightening quick speeds, is only the choice of one public club within an hour of Austin. The Horseshoe Bay Resort, 60 miles west of Austin, features bent grass on two of the three courses and Tiff Eagle on the other. George Atkinson of the Horseshoe Bay Resort said they have opted to go with bent grass because it provides a quality surface. He does, however, admit that it does require extra care, especially in those hot, summer months. "If you have a good superintendent, then you can take care of it. It does require additional maintenance but the rewards are that much greater." While Champions and Tiff Eagle are not considered as high a caliber as bent grass, they are considered high-quality Bermuda grasses. Still, there are those who prefer the older Bermuda such as Tif 328, Tifdwarf, and even Tif 419 (normally used in fairways), especially the local municipal courses. "Tif 328 is so much more resistant to so many things," said Jeff Wilson, head professional at Bluebonnet Hill, which uses the original hybrid grass. "It thrives under punishment such as higher traffic. It doesn't mind the heat, the drought. And, it doesn't mind if you get a cold winter every once in a while." In other words, the older Bermuda is durable. According to Kevin Gomillion, director of golf at two municipal courses - Jimmy Clay and Roy Kizer - resilience is essential when you have a course that has more than 50,000 rounds a year. "On Clay we have 328 and Kizer we have 419. They are both good with as much traffic as we see." Kizer, which is the newer of the two courses, receives high marks for its greens by most of the experts, especially for a muni course. Wilson said his greens have earned their reputation as some of the best in Austin not only because of the grass type, but also because of the cut. "We pay close attention to the quality of the cut. If you get a bad cut or a cut that's not sharp, that's when everything goes downhill." The cut not only affects the appearance and general condition of the green, it also affects the all-important roll. According to the experts, Central Texas golfers like a roll that's true and fast, and not necessarily in that order. "We're never slower than an 8. The happy medium is around 8.5 because once you get up to a 9 it can be difficult for the average player," Wilson said. He said faster greens also make for a more efficient putting stroke. "It's easier to make the putts on fast greens. You don't have to hit it, but stroke it." "Greens should have a quality of smoothness where they can keep the ball on the ground," Gomillion said. A good public course is running 8 or 7 and smooth where you can stroke it and get it there and not have to beat it and get it through bumps." While grass type and cut are important to the condition of the greens and their overall appeal, design is also a vital element. Bechtol said in his years of designing courses, including several with Tom Kite, greens have to be aesthetically pleasing. "You want to see as much of the surface of your landing area, for starters. They should also be exciting, but not penal." Bechtol said greens that are incorporated seamlessly into the course and the natural surroundings are the ones that leave a lasting impression on the golfer. "We try to bring the surrounds around the green into the green. If you have some rolling characters such as mounds, then they ought to carry into the green. It's really more than the green itself. It's really the whole surrounds." He said each green should also be proportionate to each hole and its layout. "The green ought to fit the hole. If you have a long hole then you want a big green. If you have a reachable par 5, you ought to have a little green." Whatever the course may be, Austin and Central Texas has a variety of fine greens to choose from. In addition to those mentioned, there are several others in and around Austin that deserve honorable mention: ColoVista in Bastrop, Forest Creek in Round Rock, and Riverside Golf Club in Austin.